Attain a SCOBY (Symbiotic Culture of Bacteria and Yeast) from a friend or store bought. Make sure the gifted SCOBY comes in about a cup to a cup and a half of starter tea. If you bought your SCOBY dried, buy some kombucha from the store to bring your SCOBY to life. Get a gallon of white vinegar to sanitize all containers and equipment, including your hands! Anything that touches the SCOBY needs to be sanitized. Get a sun tea container (2-3 gallons is best) or any type of jar with a spigot at the bottom to drain the finished tea out of. Bring 4 cups of water (filtered) to a boil. Turn off the heat and add 6 tea bags. Steep tea for approx. 20 min, stirring occasionally. Remove tea bags and add 1 cup of organic sugar and 8 cups of cold, filtered water. Pour the cool tea into your container and add two more cups of cool, filtered water. It's important that the tea cools to room temperature, or it may damage your SCOBY. When the tea has cooled, pour in the SCOBY and a cup to a cup in a half of the starter tea. Now that your SCOBY is in the tea, cover the jar with a thin cloth. Cheesecloth can often allow fruit flies, so use a thin dishtowel. Seal the rim with a rubber band. After 7-10 days, taste your tea to see if its as tart as you want it to be. 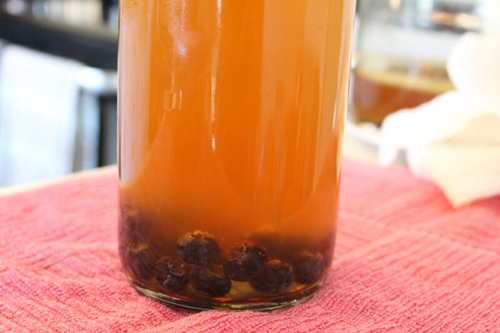 If you want a kombucha that is more vinegary, allow to ferment longer. When you are satisfied with the flavor, take out your SCOBY and place in another sanitized container with a cup or two of the brewing liquid. This will be used to start your next batch. Start collecting glass bottles, preferably the ones with the flip tops. Drain your tea into glass bottles and close tightly. Allow to sit on the counter at room temperature for a few days. This is the second fermentation that gives kombucha carbonation. Be careful when storing, kombucha has been known to explode during second fermentation. Keep in a cupboard to be safe. If you prefer a flat kombucha, you can drink it immediately after the 7-10 days. 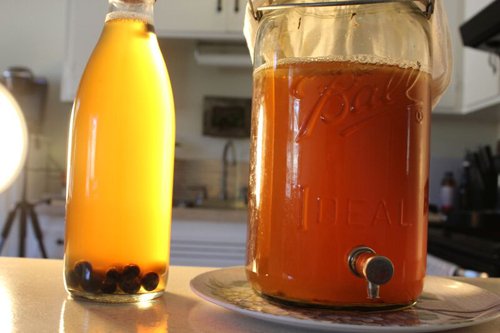 To flavor, add some fresh juice or fruit to bottles for second fermentation. To brew kombucha continuously, start the process over and place your SCOBY back into the container with the freshly brewed tea.